Kikara is a small village and seat of the commune of Gandamia in the Cercle of Douentza in the Mopti Region of southern-central Mali. The village lies on the northern slope of the Gandamia Massif (or Dyoundé Massif), an inselberg that rises 750 m above the plain. The massif extends for 60 km in an east-west direction and 10 km north to south. 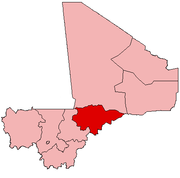 ^ Communes de la Région de Mopti (PDF) (in French), Ministère de l’administration territoriale et des collectivités locales, République du Mali, archived from the original (PDF) on 2012-09-19 . This page was last edited on 10 December 2017, at 05:43 (UTC).